*slaps knee* that was so punny. hah. 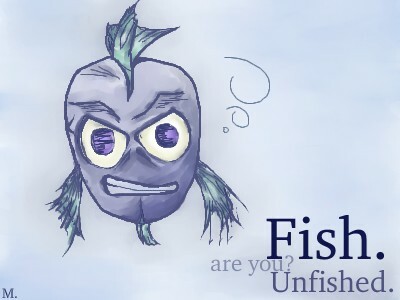 i recognise mr fish here.. from some flash thing that i cant remember ne? meh, lascaux borked again... will need to work on it this weekend. Haha. Great... looks like it eats souls. i love his expression!! hes like "what da hell are you lookin at?!?" Mean-looking little fishy...is he part pirhana? keep the scary girls away from me mommy!